A letter from Orlando Postmaster James D. Beggs, Jr. to Senator Charles O. Andrews (1877-1946). In reference to two prior letters, Beggs had prepared statistics for Sen. Andrews’ speech to be delivered at the dedication ceremony for the new Downtown Orlando Post Office . 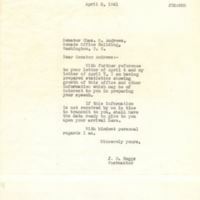 "Letter from James D. Beggs, Jr. to Charles O. Andrews (April 9, 1941)." RICHES of Central Florida. https://richesmi.cah.ucf.edu/omeka/items/show/7613. 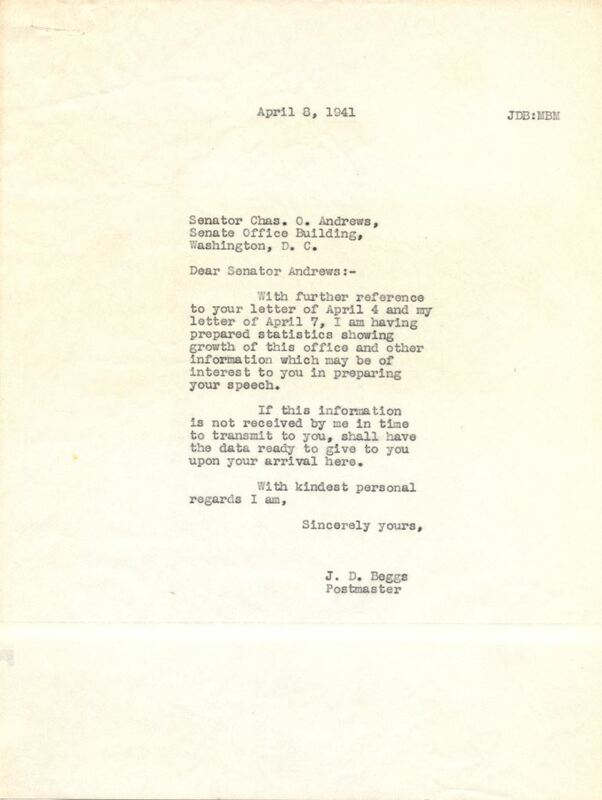 Beggs, James D., Jr.. “Letter from James D. Beggs, Jr. to Charles O. Andrews (April 8, 1941).” RICHES of Central Florida accessed April 24, 2019, https://richesmi.cah.ucf.edu/omeka/items/show/7618.